We issue a series of weather reports each business day starting at 5AM CT, with updates again at midday. 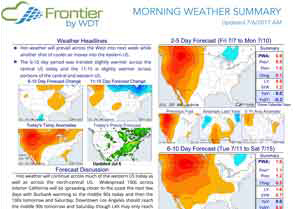 We also issue several of our reports on Sunday morning as well. These reports are available both on the website and by email distribution. You can view samples of our reports by clicking on the image links above. We produce wind generation forecasts for nearly every major wind farm in the US and Canada, covering more than 83,000 MW of installed capacity. 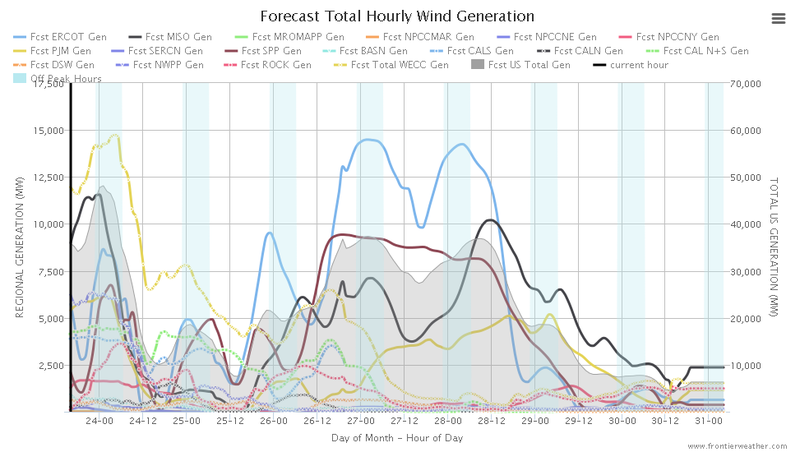 Wind generation forecasts are available out to seven days, and are updated hourly. 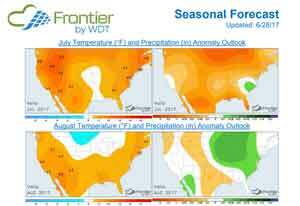 Frontier Weather utilizes an ensemble of many computer models to maximize forecast accuracy, including data from the NAM, DGEX, HRRR, RAP, SREF, GFS, CMC and more. Forecast data is available for individual wind farms and aggregated by power region in both graphical and csv data file format. 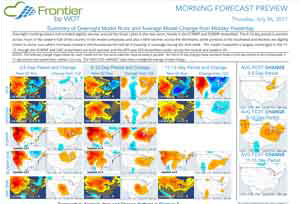 We produce thousands of model graphics and data files each day for the US and international regions, including from the ECMWF operational and ensemble models. Maps and data file output is available for temperature, precipitation, snowfall and other data types. Many of our temperature anomaly maps update in real-time as model data becomes available and we send real-time email updates for the 12Z GFS and ECMWF models. 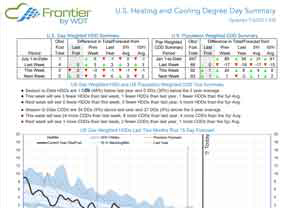 Historical and forecast US and regional degree day data is available in a variety of formats. We produce hundreds of data files each day, including population, natural gas heating, and oil heating weighted degree day data. Files are available with various periods of record, and also with various weighting schemes. We have some data sets where weights are fixed to 2010 values, and others where weights vary by year based on population and consumption trends. 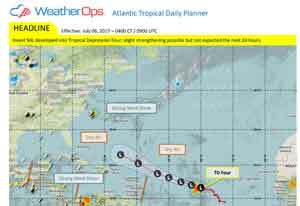 All degree day data files are updated twice per day on business days, as well as on Sunday mornings. 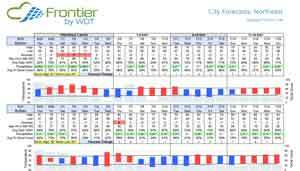 Our 15 day forecasts have historically matched or outperformed most weather vendors during the last two years. 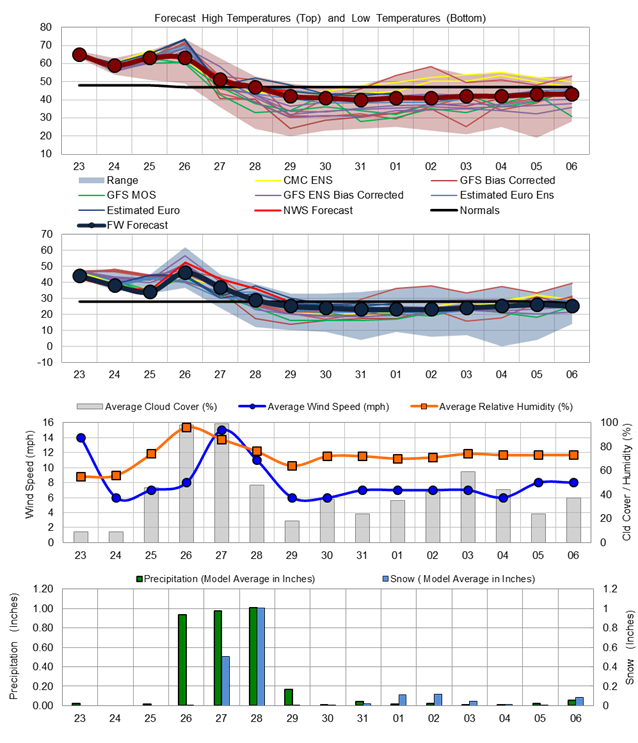 During 2015, 98% of our daily forecasts in the 1-5 day period were within 5°F, as were 79% in the 6-10 day period and 62% in the 11-15 day period. Ready? Start a Trial or Subscribe! 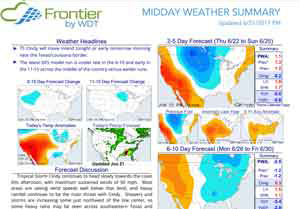 Copyrights © 2019 All Rights Reserved by Frontier Weather Inc.